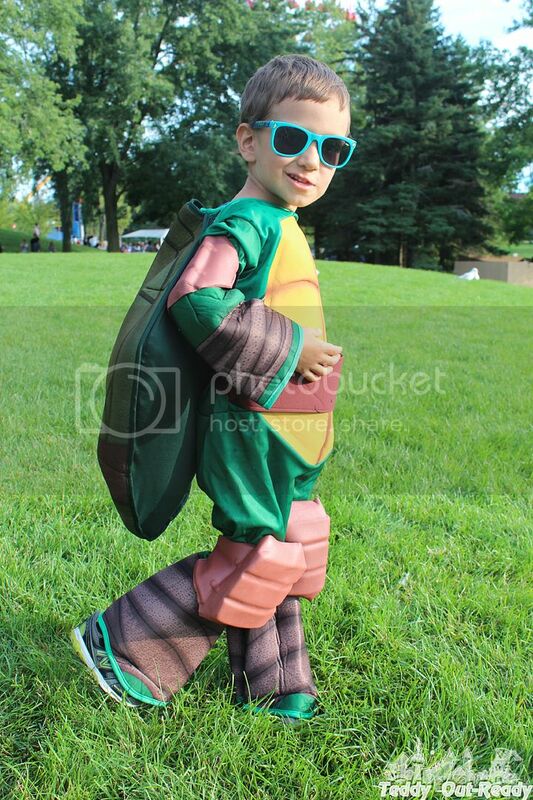 With recent release of Teenage Mutant Ninja Turtles movie, kids easily find their heroes and want to be the ones, copy their styles and moves during role-plays and definitely are happy to dress up. 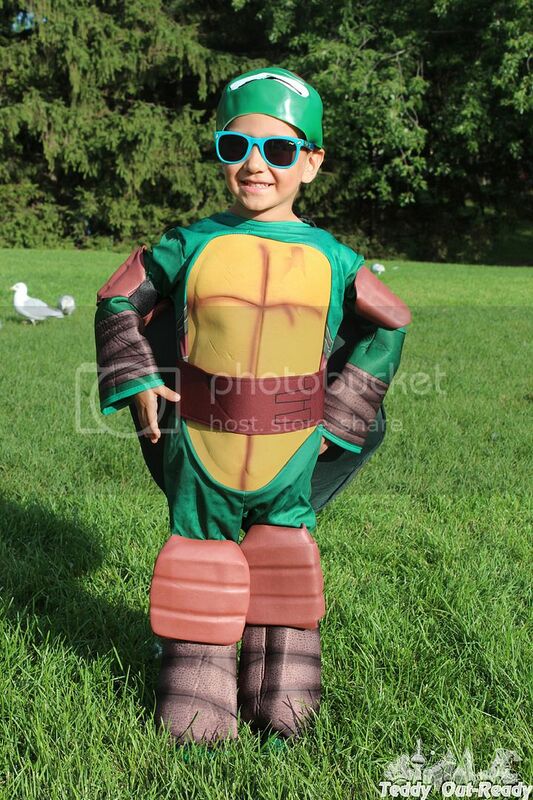 Just to give our little one a chance to be one of his favorite characters from Ninja Turtles, we got him Mutant Ninja Turtles Deluxe Raphael Costume. This time we ordered for Teddy small size costume for kids ages from 3 to 4. 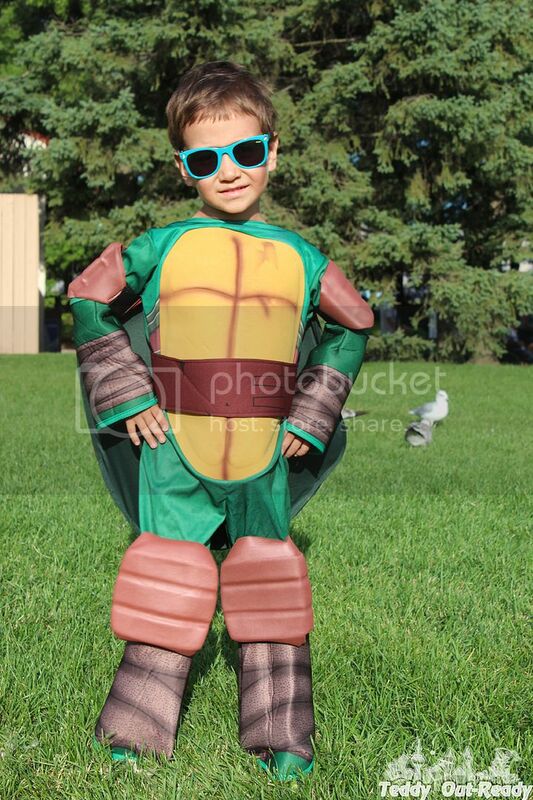 His Ninja Turtle outfit features a jumpsuit with attached belt and a padded turtle chest. The belt needs to be tied on the back. The design on cuffs and bottom of jumpsuits matches, adding that the costume has shoe covers with elastic band and Velcro closure. Teenage Mutant Ninja Turtles are truly superheroes and use their turtle art and battle skills to fight bad guys and help everyone in need. In their dangerous life they need to have protective gear like elbow pads and knee pads. 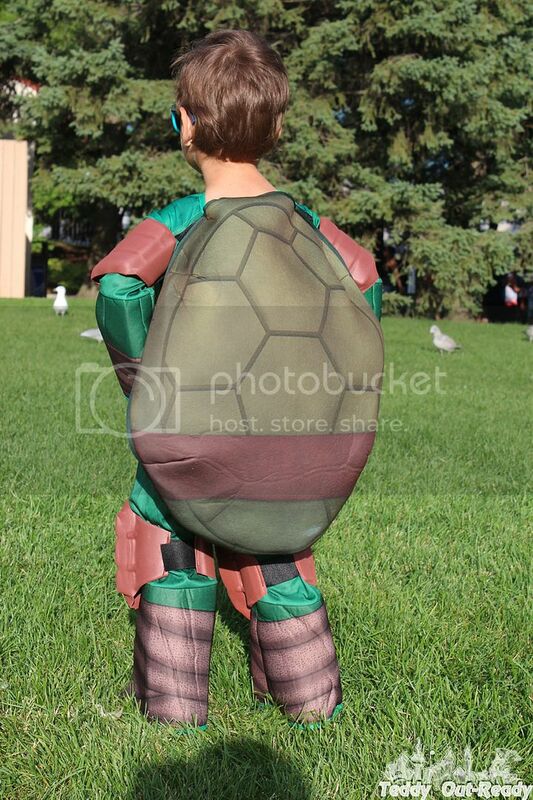 Teddy’s Raphael costume besides protective pads also has turtle shell which needs to be filled with something to give it a 3D look. We stuffed it with a little pillow to achieve the desirable effect. The shell needs to be attached to the costume using two Velcro fasteners. And the final touch brings a plastic mask also with elastic band to fit the kid’s head. 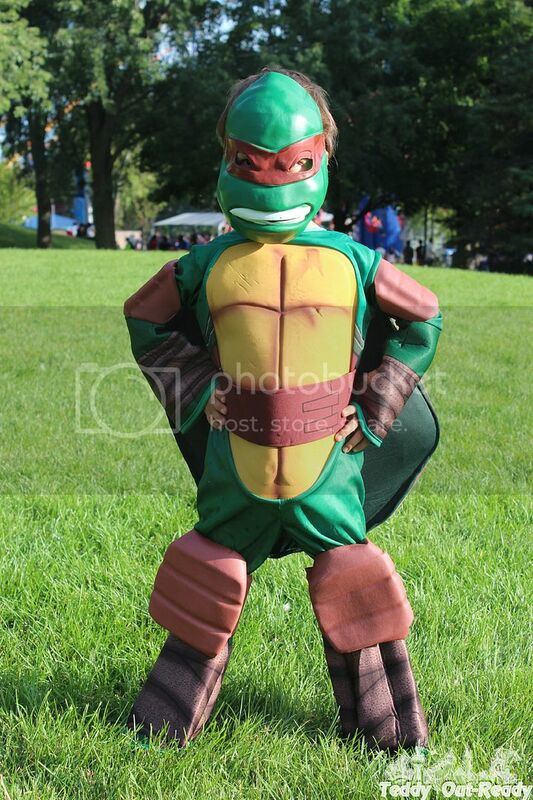 I am glad that Teddy has chosen to dress up as Raphael among other Ninja Turtles, as I consider Raphael the most responsible one while Teddy think he has the best martial arts skills. While we can state that Teddy has his costume for Halloween, he already started wearing it when watching TMNT shows and videos or attending entertainment parks. I can say that the costume fits Teddy perfectly, he is skinny but tall. All the accessories we have are really fun to wear. Only the mask Teddy tends to take off when play outside, because he cannot climb with it or take slides. 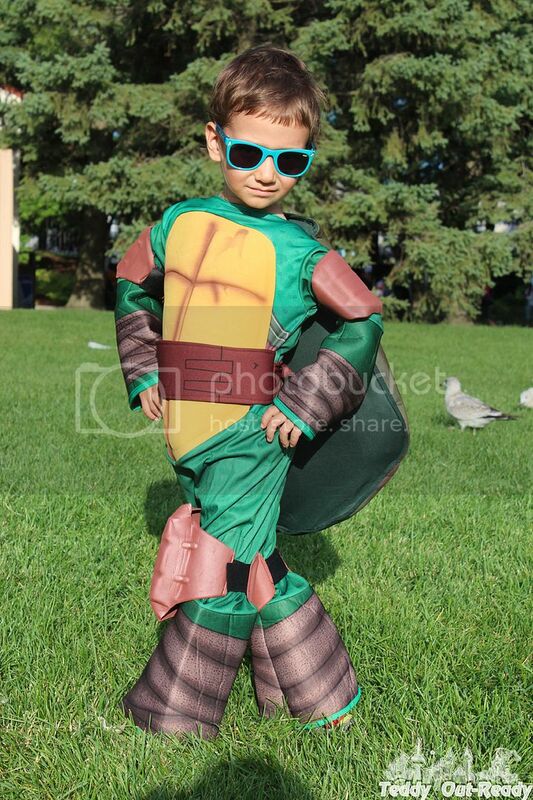 Even when we take off the mask all kids and adults still notices and comments about his Raphael Turtle Ninja costume. Who does not familiar with Teenage Mutant Ninja Turtles? For more information about this costume and many other for kids and adults Click Here.